In an ideal world, parents would have time to make their infant’s and toddler’s baby food from scratch. Actually, it’s not that hard to do if you eat whole foods yourself. Baby can eat what you eat if you follow a simple diet; however, we don’t live in an ideal world. Even stay-at-home parents need the convenience of prepared baby food, and you better make it organic and contained BPA-free packaging for optimum baby health. All products are organic, no salt, sugar, fillers, preservatives, no nuts. No dairy, except in Old Fashioned Apple Crisp. Packaged in in a specially designed pouch allows for less cooking time, locking in nutrient values and flavors. All ingredients are organic with the exception of the ascorbic acid. Unfortunately, the BPA-free packaging is not recyclable, but it does make for easy heating. Personally, I like baby food jars. They are very handy to reuse for multiple purposes, but I would assume the lids on them contain BPA, as most canning jars lids do. As much as I aspired to always make my own baby food and freeze extras, I did resort to store bought baby food on occasion, especially when traveling. Baby Gourmet is a good option, and I trust the product’s safety and quality, especially since it is made in Canada. Would I buy this product? Maybe. One of our most popular posts “Baby Essentials That Aren’t, Part 7: Baby Food” explores the “baby-led solids” method of feeding. I think I would try this if I had to do it over again, but I also do think there is a place for puree. I eat pureed food, so why shouldn’t baby? Plus, my son had immature oral motor skills in his mouth and choking was a concern. I like that Baby Gourmet is very organic (not just one or two ingredients), but I do wish the packages were recyclable. I also like how they have recipes where you can incorporate the baby food with solids to help transition children. 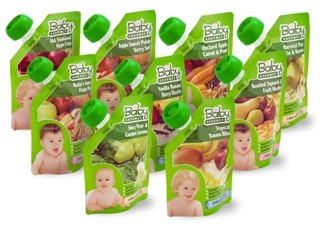 Thank you so much Jennifer for the help about the baby food.. how did you get the free samples of the Baby Gourmet?? I would like to have some free samples too. I have found other sites that give away free sample stuff like this one http://raw-reviews.com/free-baby-products/ but im not finding stuff like baby gourmet on those type of sites.